Readers who know their sacred choral music will prize the 1990 Hyperion CD of Gradualia from Byrd's Marian Masses sung by the William Byrd Choir. This was the last of three commercial recordings made by the William Byrd Choir before it was disbanded, and their founder and director Gavin Turner told the story of the ensemble in an exclusive article here in 2006. 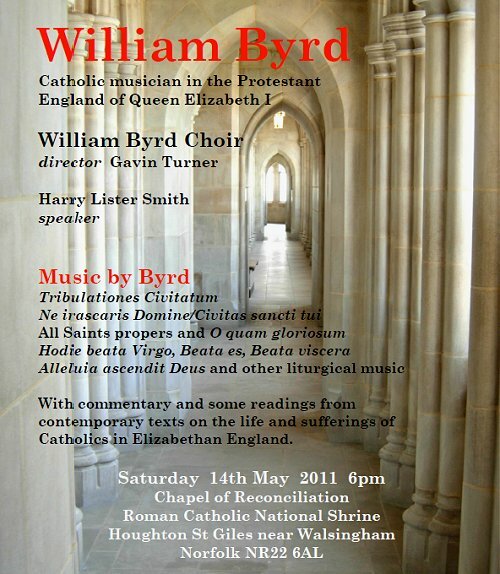 Now comes the exciting news that the William Byrd Choir is reforming for a single concert. This is being given at the Chapel of Reconciliation in the Roman Catholic Shrine in Walsingham, Norfolk on May 14 and the theme of the concert is the life and sufferings of Catholics in Elizabethan England. Of Gods, Men and Music - 1 is here. Tickets for the concert priced at £10 are available are available by mail from The Pilgrim Bureau, 950 Tickets, Friday Market, Little Walsingham, NR22 6DB with cheques payable to RC National Shrine and please write '950 Tickets' on the reverse. Report broken links, missing images and errors to - overgrownpath at hotmail dot co dot uk Also on Facebook and Twitter.